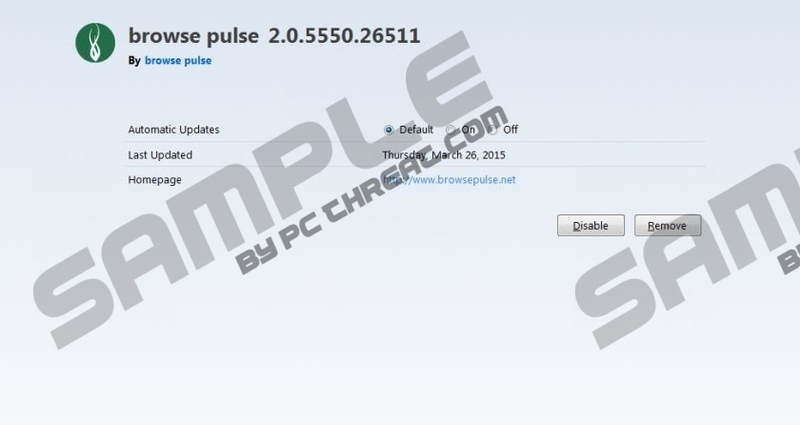 Browse Pulse is yet another adware program, known to be circulating the web lately. If your browser is flooded with various third-party commercial ads and annoying pop-ups, it is a strong sign that this intrusive application is active on your operating system. Even though, it is advertised as a useful tool on its official website; you should know that all the promises are just a marketing strategy used to lure unsuspecting users into downloading and installing Browse Pulse. If, unfortunately, your PC is already infected with Browse Pulse, read the rest of this article and find out how to remove this annoying adware program. We have crafted a detailed removal guide that we provide below; it should be used as soon as Browse Pulse is located active on your PC. While researching this adware, we have discovered that it is a clone application of adware programs such as Positive Finds, Strong Signal, and Roaming Rate. Thus, it is quite natural that Browse Pulse functions in the same way as its counterparts. Once this annoying adware application gains access to your computer, your web browser will be filled with utterly worthless ads and pop-ups. This activity makes surfing the web a dreadful experience, to say the least. What is even worse is that Browse Pulse could even be the cause why other Internet-based infections can enter your operating system in a silent way. This is possible as Browse Pulse could start a silent update process, which could download not only the need update software but a whole range of other Internet-based infections. Thus, you could end up with an operating system filled with various malicious applications without even realizing. This is an extremely dangerous instance, and it should be more than obvious. This is exactly why we firmly advise you to remove Browse Pulse without any hesitation. Once the manual removal of Browse Pulse is executed the next crucial step that you should take is to conduct an in-depth analysis of your operating system. We provide a detailed list of registry entries and files associated with Browse Pulse. By using the provided list remove anything that might be associated with this intrusive adware application. This is crucial because just a single file or a registry entry could trigger a silent restoration process of Browse Pulse. If you think that manual analysis of your PC is too complicated, we recommend scanning your PC with a reliable antimalware tool once the removal is carried out. Right-click Browse Pulse and select Uninstall. Select Browse Pulse and click Remove. Select Browse Pulse and click Uninstall. Quick & tested solution for Browse Pulse removal.